The week of my 35th birthday, I just wasn't feeling quite myself. Tireder than normal, pukier than normal, I just felt like something was different in my world. 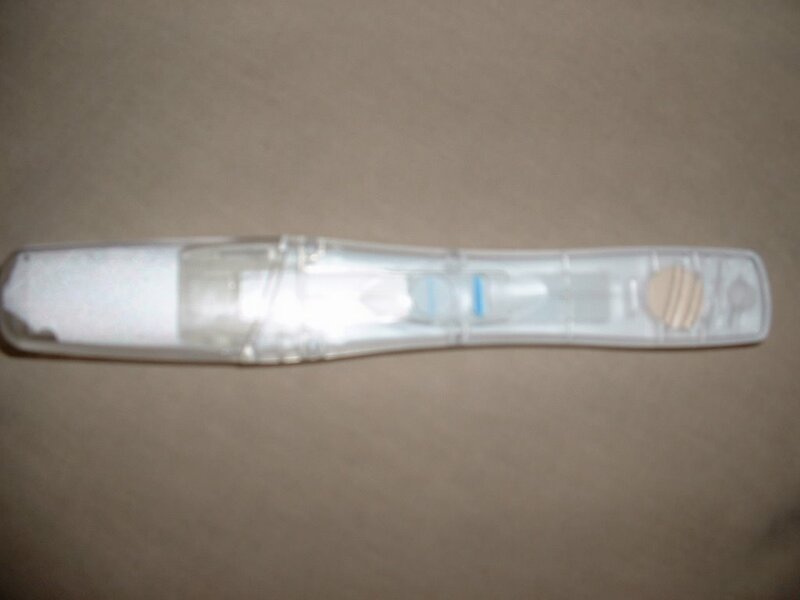 So the day after I turned 35 I took a pregnancy test, and low and behold...a BFP (big fat positive for anyone unfamiliar with the terminology). With a 9-month old into everything, it was a bit of a surprise, but we are all thrilled with this blessing and are looking forward to another arrival joining our family! Last week, at 7 weeks, 1 day, I had an ultrasound just to make sure my dates were correct. I was still nursing Grace when I got pregnant and wasn't certain about everything, but the little bean was measuring right on and I was able to see and hear the heartbeat. A healthy and strong 158 beats per minute. Due date is early April, 2007. 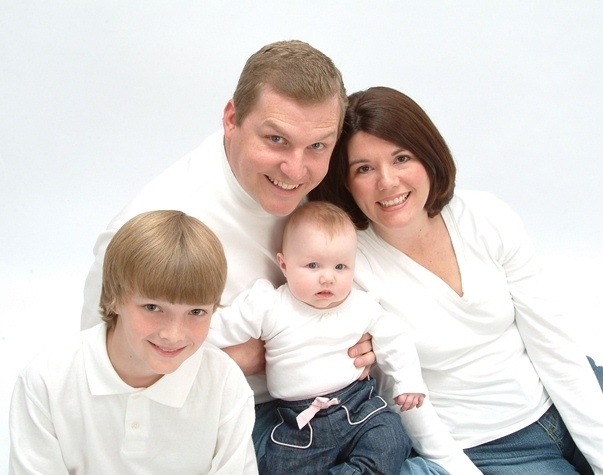 While pregnant with Grace, I gained 58 pounds and had a whole host of complications. So this time, I met with a nutritionist early on. Only a week or two after finding out I was pregnant, I was already using it as an excuse to eat whatever I wanted. Luckily, my last pregnancy is still fresh in my mind and I really, really want to be healthier this time (and have less weight to lose on the back end), so I'm on a "diet." It's not so much a calorie restriction diet (though I know that I don't need to consume enough calories for two grown people), it's more of a guideline concerning the kinds of things I eat. So far it's working great. The weight gain has stopped (I should only gain 0-3 lbs in the first trimester and I had already gained 4 BEFORE meeting with the nutritionist) and I am feeling satisfied. My blood pressure readings have also been great at home and I am determined to BEAT the white coat syndrome this time and get good readings at the doctor's office! So, I actually started this blog several months ago, got busy and when I tried to get back in tonight, I couldn't for the life of me remember how to sign back in. Luckily I was able to find my old blog online and copied the posts I'd already made (all TWO of them). So anyway, the plan is to keep this one running. We shall see! Oh, Look at her cute little shoes! 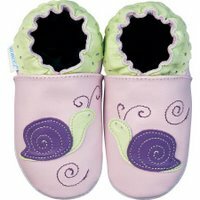 However, when I was pregnant with Grace, a guy I worked with talked often about Robeez, these cute little leather moccasins his daughter was wearing. At first I thought it sounded a little silly, but I decided to research these little shoes to see what all the fuss was about. After reading many rave reviews, I went to ebay and made two bids, hoping that I could win one pair and check these little shoes out. They are available in a few boutiques and at Stride Rite in my area, but the styles are limited and I am picky. Much to my surprise (and Aaron's dismay), I won both pairs. The shoes arrived and boy were they cute!! I carried them around for awhile just to show people what my future baby would be wearing. Grace was born large, but with tiny feet. However, when she was just about a week old, I pulled the Robeez out because they matched one of the darling, girly outfits I had for her. "These will never stay on those little feet," I thought. But they did! I have attached a picture of Robeez in case you've never seen them, but they are almost like "leather socks." They have elastic around the ankle that is magically tight enough to keep the shoes on, but not so tight that it is painful to baby. Grace now wears them all the time and the only time she seems to notice they are there is when she goes to chew on her toes and can't get to them. Fortunately, she thinks the Robeez are quite tasty too. Oh, and just to save you a little embarassment, the correct pronunciation is Rob-eez, not Row-beez. I only know this because the woman who created them was on Yummy Mummy one day. She named them after her son. I must admit, all the press has piqued my interest and I thought it was time to give it a shot. I often have random thoughts in my head that need a place to shine, so I guess this will be it. My life these days consists of mommying an almost 10 month old (Grace), mothering a 10 year old (Tyler), being a good wife to Aaron, working (I do contract work from home), and church. I am busy, but aren't we all? For work, I am a contractor for marketing research companies. Years and years of researching new products has made me quite a keen consumer. I am always looking for hip new stuff and I suspect that my blog will consist of reviews of the things that are hot topics in our household. Being the mother of a young baby, I am a target for many neat, new baby products and some of them just need to be discussed. In my blog I will attempt to weave these reviews into boring musings of everyday life in our house. Melissa - That's me. I am 35, wife of Aaron, mother of two beauties. I met my husband Aaron online (gasp!) 4 years ago. We have been married almost three years and have a 10-month old daughter together. Tyler - Tyler is my 10-year old son from a previous marriage. He is smart, athletic, and a really good kid, especially considering he's entered his "tween" years. Tyler plays soccer and basketball is is going to give baseball a shot next year. He stays with his dad half of the time and with us half of the time. We look forward to his weeks with us and things are really only "complete" when we are all here. Grace - Our little "Gracie Girl" is our newest addition. She was born in November 2005, a month early, weighing in at about 8.5 lbs. She has been pure sunshine since she arrived. Oh yeah, she has her moments where she cries (as do all babies), but for the most part this little girl is happy all the time. She loves her mommy and daddy and is particularly fond of her big brother. Tex and Caroline - These two are the canine members of our family. Tex is a four year old yellow lab and Caroline is a 3 year old Heinz 57.